Energy Democracy, by Craig Morris & Arne Jungjohann, is one of the most powerful books on the renewable energy revolution in decades. It’s a chronicle of the remarkable transformation underway in the world’s fourth-largest industrial economy. This energy transition, or Energiewende in German, is about a people’s desire to replace fossil fuels and nuclear power with renewable energy. It’s about a people leading their politicians and their government to a renewable future, despite naysaying and sometimes slander from those with the most to lose. It’s about Jeffersonian democrats unwilling to take “no” for an answer when told they couldn’t install their own wind turbines or solar panels, who rose up and peacefully revolted, demanding the right to connect to the grid and get paid a fair price for their generation. Energy Democracy, the book, is an uplifting--if not inspirational--tale for people everywhere. It explains how a citizen’s movement has had such a profound effect on energy policy in a diverse nation of 80 million people, and it serves to debunk the myths and outright propaganda on just what the Germans are doing and what they’ve accomplished. In this regard, the book is particularly relevant for North Americans and serves as a guide for how we can use renewable energy to rebuild our crumbling democracy. It’s as if the authors are saying that Germans learned a valuable lesson in democracy from Americans and they are returning the favor to their benefactors. That’s just by way of introduction. I’ve been putting off a review of Energy Democracy for months now. What can one say about a 437-page book on a topic that has been a thread through your entire career? I feel inadequate to do it justice. Most of the pages in my copy are now dog-eared and the highlighter colors entire passages. If you’re a proponent of the rapid growth of renewable energy, you must read this book. If you’re a proponent of community ownership of renewable energy, you must read this book. If you’re a proponent of a more egalitarian, peaceful, and democratic world, you must read this book. And if you’re a wealthy donor who is worried by the fate of democracy in North America, buy several thousand copies of Energy Democracy and give them away to every political science and energy policy class on the continent, to every member of Congress, to every state legislator, and to every environmental organization. Energy Democracy is not light reading, but it’s eminently readable. There are no pretty pictures, no charts, and only two tables. There’s much here in English that otherwise is only available in the original German. It’s a fully-footnoted discourse on how four decades of activism by German citizens changed a nation’s energy policy and thus strengthened their democracy. These are dark days for Americans and for American democracy. We have armed Nazis marching in the streets. The threat of civil war hangs in the air amidst the whiff of tear gas. Disclosure: The authors mention me and my work favorably in the preface and as an exponent of local ownership and a long-time fan of Craig Morris’ work, I was asked to comment on early drafts. Consequently, I feel invested in this book even if it’s not mine. Maybe it’s appropriate then that we should turn to Germans for guidance on how to rescue our democracy. It was Germans, after all, who once lost their way and paid a heavy price for following flag-waving fascists with their stiff-armed salute. They survived, rebuilt, and prospered. Now Germans have given back to the world a powerful story of how local people--villagers, urbanites, common citizens all--took control of their own destiny and ultimately the destiny of their nation. It’s a story of courage, creativity, and entrepreneurship. More importantly, it’s also a story of how to make a dream a reality—the dream of a peaceful revolution led by kaffeeklatsch. If you’re a student of languages, or a student of history, there are passages in Energy Democracy that are so powerful it’s hard to read them with a dry eye. Take the struggle to stop the nuclear plant proposed for Wyhl, a German village across the Rhine from Alsace. The peoples on both sides of the French-German border speak a similar dialect, not French, not quite German. The authors quote one French activist from Alsace, “Our parents shot at each other. But the next time Paris and Bonn [then still the capital of West Germany] have some stupid idea, we are not going to play along!” Despite their long and bloody history, the two peoples realized they had more in common than what had separated them for so long. They understood they were more powerful together than apart. And for the first time in Europe, they stopped the state from building a nuclear power plant against the will of the people—German and French. This chapter on the confrontation between the German state and its citizens who wanted a more peaceful, democratic, and decentralized energy system is alone worth the price of the book. Who knew that a dog in heat could turn the tide in the battle between the state’s police powers, with their infamous German shepherds, and peaceful protesters occupying the proposed construction site? The authors are experienced professionals who both know energy and the political systems governing energy policy in Germany and the United States. Arne Jungjohann is a political consultant to Germany’s Green Party. He served as special adviser to Germany’s first Green Party Minister President, a post similar to a state governor or provincial premier in North America. He spent several years ensconced at a Washington, DC think tank where he could observe American policy first hand. Craig Morris is the lead author of a website devoted to Germany’s Energiewende and those trying to emulate it around the world. Morris has written extensively about renewable energy and energy policy from his base in Germany. Unlike his earlier book, Energy Switch: Proven Solutions for a Renewable Future, written first in German and then into English, Energy Democracy was conceived from the beginning in English. This was a book written for the benefit of the English-speaking world. Germans already know the story. They’re living it. The authors don’t pull any punches when comparing American democracy to that practiced in Germany. One sidebar is titled: Voter Suppression and Gerrymandering are Two Words that Don’t Exist in German. Ouch. This is particularly painful when you understand that the United States imposed its form of constitutional democracy on defeated Germany after World War II. We, the victors, have passively watched our rights slip away, while German citizens have continued to fight for ever-greater inclusion in their government. The story of Germany’s Energiewende is the story of citizens exercising those rights. I’ve quibbled with the authors in the past about translations into English of two terms essential to the Energiewende story. (The authors are fluent in German. I am not.) I prefer a slightly different translation of Energiewende itself. For me, Energy Revolution is more descriptive. The authors make their case for Energy Transition, a more neutral and possibly less intimidating expression than “revolution,” with its connotations of violence. However, what the Germans are doing is profoundly revolutionary and we should not be afraid to say so. It’s revolutionary to switch from an energy system dominated by fossil fuels and nuclear power, controlled by multinational conglomerates with no allegiance to nation states or the citizens of those states. It’s revolutionary for a nation to make this switch by empowering its own citizens to drive the transition. Though it shouldn’t be so, it’s revolutionary even in a democracy to give the people more power to determine their own energy destiny. The authors also translate Stromrebellen as Power Rebels. I prefer Electricity Rebels as more specific to what the rebels have done, taken control—peacefully and legitimately—of their local supply of electricity. The Energiewende has, until now, been about Germans rebelling against how electricity was being generated and against those generating the electricity. These rebels wanted to generate electricity with wind, solar, and biogas for their own benefit, the benefit of their neighbors and the community at large. They did not want electricity from nuclear power, especially after Chernobyl. One of the themes coursing through the book is openness and transparency of decision making. Their case against nuclear is that nuclear energy requires centralization, authoritarianism, and secrecy. It would have been fine for the Romans, a military society, but using nuclear power is antithetical to democracy. It was the secrecy and authoritarianism that the protesters at Wyhl were revolting against, as much as nuclear power itself. Early in the book the authors dissect the disastrous folly of German engineering in the development of Growian, at one time the world’s largest wind turbine. In a chapter titled “The Folly of Innovation without Deployment,” the authors tackle a subject I’ve wrestled with for several decades. Renewable energy is not nuclear power. It works best and advances fastest when its technological revolution is led from the bottom up and not from the top down. Morris and Jungjohann use Growian to illustrate this. With original source material from the period, the authors argue that many of the participants didn’t believe it would work and some didn’t want it to work. I’ve singled Growian out in many of my books as an example of how the top-down strategy fostered by central governments in the West retarded wind energy rather than aided it. Turns out, at least in the German case, it may have been intentional. This is where the scholarship in Energy Democracy is helpful to academics and policy makers who don’t speak German. The book cites documents showing the CEO of one powerful German utility saying pointedly, “We need Growian to prove that wind power won’t work.” He got his wish. Growian operated only 420 hours, about an hour for every ton of material in the nacelle, before it was destroyed. It was one of German engineering’s most monumental failures. It is Germany’s massive development of wind, solar, and biogas—not endless research and development—that has made renewable energy cost effective for everyone. At their expense, Germans have proven that renewables are here now, they work on a large scale, and they cost no more than the fossil fuels and nuclear power they replace. This then is Germany’s gift to the world, developed and undeveloped countries alike. One of the pioneers who revolutionized the industry literally from the ground up is Aloys Wobben, the founder of Enercon, now one of the world’s largest manufacturers of wind turbines. Energy Democracy recounts the tale of Wobben’s intent to install one of his early turbines in the former East Germany shortly after reunification. The farmer who wanted Wobben’s wind turbine had no phone and no car. He had to hitchhike across the old border to a phone to coordinate the installation. There were no hotels in the east then either. Wobben slept on the floor of the farmer’s house in a sleeping bag. Wind pioneers, indeed., They, not the utilities and not the big German engineering companies, are the ones who made wind energy a success. And she did. Sladek and her rebellious cohorts in the depths of the Black Forest persisted. They eventually bought their utility and now run it their way with renewable energy. Sladek went on to win the Goldman Environmental Prize, the world’s most prestigious award for environmental action, and subsequently met with then-President Barack Obama. She and the Strom Rebels of Schönau became a beacon of hope for renewable-energy activists everywhere, not just in Germany but around the globe. The village of Schönau is a good example of a town where conservatives are also conservationists. And no one sees anything odd about that. This is a reoccurring theme of the book. The authors devote an entire chapter to the topic. They take relish in pointing out that the leading politician in Germany today supporting community-owned renewable energy is not a Green nor a Social Democrat, but a conservative from Bavaria, the most conservative region of the country. Rhetorically they ask, why isn’t that the case in America? The authors clearly target American readers in trying to explain not only how Germany’s Energiwende came about, but also why Germans prefer ordoliberalism to the American version of neoliberalism. Their chapter on “Green Capitalism” is a powerful indictment of America’s economic elite’s self-serving interpretation of economic liberalism and its sole focus on price. Imagine a book on energy policy that cogently argues that Americans got Adam Smith wrong, and that this is wreaking havoc on the fabric of the nation. The resulting economic inequality leads to the rise of demagogues—a fate that Germans know too well. The last third of the book is the authors’ paean to German emphasis on consensus policy-making as opposed to the winner-take-all approach common in North America. Thus, the Energiewende continues despite changes in government. There’s near-universal agreement across the political spectrum on the long-term objective. This results in policy continuity, in contrast to energy policy in North America, particularly the United States, where it is on-again, off-again, depending upon which party comes to power. 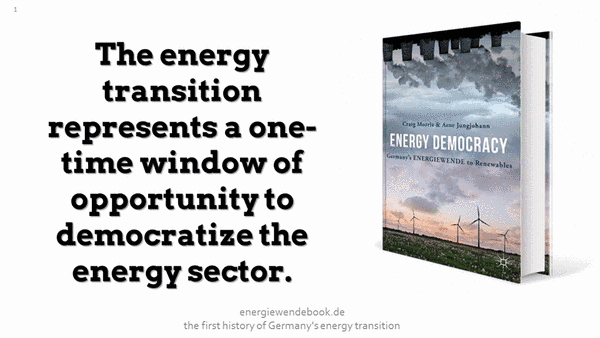 Most importantly, Energy Democracy emphasizes that the Energiewende is a people-led revolution. German citizens demanded the right to build, own, and operate their own wind turbines and solar panels. And where the government or monopoly utilities stood in their way, they forged ahead without them. German politicians had to run fast to stay out in front of this grassroots movement. Energy Democracy closes with a warning that the transition—or revolution—is a one-time event. It’s going to happen. It is happening now—certainly at slower pace than necessary. Nevertheless, the authors warn that if citizens don’t take action now, don’t take control of their energy destiny, they will be shoved aside by the same forces that held renewables at bay for so long—governments beholden to corporate lobbyists, utilities, and multinationals. Already, Energy Democracy warns, Florida Power & Light is the largest producer of wind-generated electricity in the United States. And nearly all the remainder is owned by other utilities. It need not be so, but if American citizens don’t act now, the opportunity to own their own solar or wind generation will be lost forever. The chance to democratize how we produce and use energy will slip from our grasp. That’s why Morris and Jungjohann boldly titled their book Energy Democracy. It’s a call to action. Morris, Craig and Jungjohann, Arne. 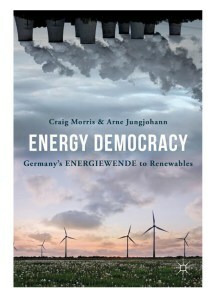 Energy Democracy: Germany’s Energiewende to Renewables. London: Palgrave Macmillan, 2016. 437 pages. ISBN: 978-3319318905. Epub: ISBN 978-3-319-31891-2. $49.99 cloth, $39.99 epub. 6.1 x 1.2 x 8.6 inches.